While the Chronicle Herald was very much the “establishment” paper (and remains so today), the Daily News was the upstart, cheeky, rabble-rousing new kid on the block – the paper that was willing to upset the apple cart with more vivid opinions and harder-edged reporting, along with some columnists who could really get up people’s noses, yours truly among them. For a paper that represented Atlantic Canada’s largest city and self-proclaimed cultural center, the Daily News had a particularly vibrant arts section that initially put the Herald‘s stodgy reportage to shame. The Herald had long been saddled with a Victorian-era British Entertainment Editor named Basil Deacon. He wrote endlessly, for example, and usually breathlessly, of David Lean’s last film A Passage To India, a movie that, while quite good (and made in the mid 1980s), could easily have been fashioned in the 1930s. Deacon was a wonderful and charming man, but his Dickensian tilt fit Halifax’s colonial past a little too closely. Competition from the Daily News induced the Herald to switch their ace court reporter Greg Guy over to the editorship of the arts department when Deacon eventually retired, taking his British Empire inclinations with him. The dusty old Herald sputtered to life, with a cordial rivalry that resulted in the best Arts coverage Halifax has ever seen from the 1990s to the mid-2000s. While the Herald had a larger, more comprehensive book section, the Daily News coverage of music and cinema was without parallel. Sandy MacDonald’s club column “Get Outta the House!” crackled with all the energy of Halifax’s percolating live music scene at the height of the much-ballyhooed “Halifax Pop Explosion.” Having led the popular and acclaimed large-format band The Floorboards, Sandy knew how to work a room. Reaching back even further, East Coast Music Awards founder Rob Cohn wrote about the the developing recording scene while Tom Regan covered culture. Movie reviewers Lindsay Brown and Lee Anne Gillan regularly covered offerings from Halifax’s art house cinema Wormwoods, beating the hipster drum before the term hipster became hip. By the time I started writing regularly for the Daily News in 1995, the paper was hitting its peak. David Rhodenizer was the best political reporter in the Province (he is now spokesperson for the Nova Scotia Power Corporation). Parker Barss Donham was clearly the East Coast’s premiere investigative reporter, establishing a hard-hitting standard that Tim Bousquet at the Halifax Examiner carries on today. The political columnists were an eclectic and opinionated group. I wrote a weekly column on East Coast Recordings. 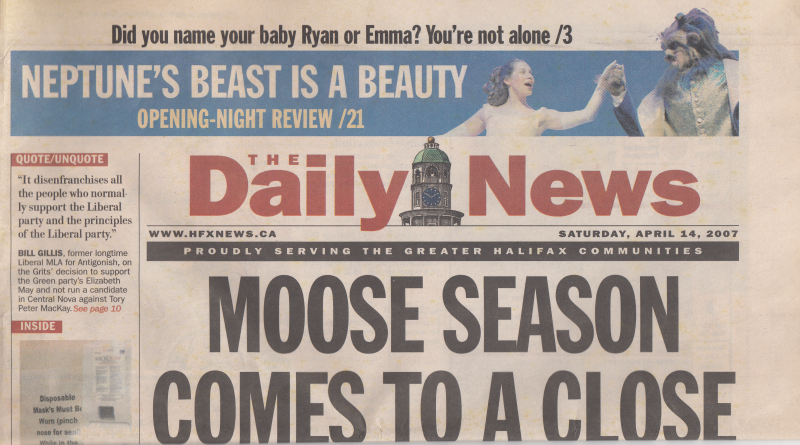 We were in the midst of the 1990s hype of Halifax as the ‘Next Seattle’. The reality was that our Celtic associated music, such as The Rankins, Rita MacNeil, and Buddy MacMaster, outsold the indie and alternative music associated with the likes of Sloan and Hardship Post by a country mile, but it was all great stuff. From a musical point-of-view, it was an embarrassment of riches that covered the eclipse of the age of cassettes and the oncoming supremacy of CDs. While recording formats where evolving it seemed like everyone in Halifax was forming a band and getting on the ever-growing live music circuit (including many people who went on to work in the film industry in the late 1990s, such as John Wesley Chisholm, Steve Comeau, Paul Kimball, John Rosborough, Jason Michael MacIsaac, and others). Halifax was written up in Harper’s Bazaar and CBC radio reported on music fans flying in from Ontario in search of ‘star’ sightings of Sloan’s Chris Murphy and Jay Ferguson. I did receive quite a few responses, and many of them were quite positive. But every now and then it went the other way. For example, I managed to stir up the pot with a review of the all-female alt-rock group Jale’s first album, “Dreamcake.” The band had signed to the then hottest label in North America, Seattle’s Sub-Pop, and was riding an insurmountable wave of hype of which was impossible to live up to. I guess I was the one to pop the bubble, calling their album “not grunge, but sludge.” A slew of letters flew in, including one that denounced me as a “sexist toad”. Ouch! As I took on the extra load of reviewing local theatre – a minefield nobody in the arts department wanted to touch – I ended up beginning an interesting dialogue with the East Coast’s drama scene, then also at a mid-1990s peak. There were some companies who put on consistently terrific work. Shakespeare By the Sea and Theatre Antigonish were revelations. The Atlantic Theatre Festival in Wolfville’s first seasons were simply extraordinary. Small companies would pop up for a couple of amazing seasons and then disappear. Meanwhile, some established ensembles laboured to produce dull, institutional work that made going to a theater a chore. I won’t name them here, as there are many in the theatrical world here on the East Coast that still bear me a grudge. I also churned out book reviews and the occasional feature piece. Often it worked out to three or four articles a week, as much as a full-time writer, even though I worked as a freelancer. Reviewing concerts, for example, put me in the crosshairs of deadlines. Whether it was a great comic like George Carlin, a musician such as Bruce Cockburn, or the prog-rock-pop group Supertramp, tearing from a 10:15 finish to get to the office – then located on Halifax’s Waterfront – to write up a review for an 11:30 copy editing deadline and next day publishing evoked images of great newspaper films like Citizen Kane and The Front Page. Pressure, yes, but what a feeling once you were done!